You would think after all the years that I have lived that I would have learnt that, no matter what, there are those who would use your friendship to further themselves at your expense. They disguise themselves as a “friend” under false pretense, to use you to get what they can out of you until you can offer them nothing more. I have been told over and over I am to trusting of people. I can’t help it that’s what makes me who I am, I’m an honest person and trust until I find a reason not to. This is my failing and imperfection. Well, I spent 6 years in the United States Naval Mobile Construction Battalions (Seabee’s) where I learnt, among other skills, how to build. I am well skilled and accomplished in the trades. When people see the things I have done, build or designed they have always the same thing, “Wow, I thought you were an Engineer?” and indeed I am but before I was white collar I lived my life as a soldier and craftsman. Then comes the next thing, “Hay, I need this or that done; do you think you can do it? I’d pay you..” 99% of the time I would do it for them for nothing except maybe a dinner, a beer or if they helped me just the companionship. So that’s how it happened, a “friend” approached me and asked if I could build her a redwood deck around new SPA she was going to purchase. I told her that that was not an easy job, she like so many others, said “I’ll pay you” I said that I just didn’t have the time right now and she all but begged me to build the deck for her. She’s a single mom who has her own beauty shop business so I said well I would take a look at what she wanted. I went to her house and measured. She wanted a deck that was 22 feet by 12 feet and went around her SPA. I told her that I could only work on it weekends as I have work (as and engineer) so it might take a while. “No problem she said” Okay so let’s stop here and put this job into perspective. This is a 22 x 12 foot deck that once built would rise 30 inches above grade. I made four designs in AutoCAD and had her choose one. I priced out all the materials which worked out to be about $2,800.00. I spec’ed out and worked with the concrete guy she hired to pour the foundation for the SPA. If she would have hired a contractor it would have cost her $3,000.00 in labor. Okay… so since she was a friend I told her not to worry about it that $850.00 would cover my costs, She said that she would give me $1000.00 I reiterated the fact that I would only be able to work weekends on her project, no problem she said, take your time. First weekend out we purchased materials, this was a Sunday because it was the only day that she could find time to buy the initial materials. The following week (during the week) she called me and asked why I was not at her house working on the deck I told her that we agreed that I could only work on weekends to which she got irate and said that not what we agreed on and began to give me grief. I should have then said well find someone else, but I gave her the benefit of the doubt and agreed to work some week days. On the first Friday of the job I told her that I would be at her house working at 8 or 9 am Saturday and Sunday she told me okay on Saturday but on Sunday not to come until after 12 because she sleeps in that day. Oh we have to talk about how much you want to do this (I guess she forgot that we already had that discussion). I finished the deck and I ended up taking 96 hours to build the deck in total and when it came time to pay me she started giving me a hard time again. I told her to keep her money… My wife felt otherwise and went to her for payment and she told my wife here but I’m going to bring an inspector in and “Bill” will have to fix anything he finds wrong. THAT WAS IT! No I don’t care if she bring 10 inspectors in, they would find nothing wrong, as a matter of fact they would tell her that I exceed code for a deck. (By the way, I told her she need rails around the deck and she didn’t want them; she has little kids) It was the mere fact that she would say such a thing, a “friend?” you would say such things to a friend. My wife gave her money back and told her we wanted nothing more then the money I spent for supplies reimbursed. Now she not even going to give that back. So here is a short video of the deck I build and I link on Flickr of pictures. You tell me..
That is an awesome deck! There is no way that it could have been built here in Hawaii for under $3,000. And regarding your so called friend, I’m so sorry that she was so completely lame about the whole situation. *sigh* Yet again, no good dead goes unpunished. She really should pay you for that, though. It will catch-up to her, karma has away of doing that. In the end she will be the one that suffers for her deeds. I take it as a lesson learned. I have a habit of getting past things quick and this is no exception. 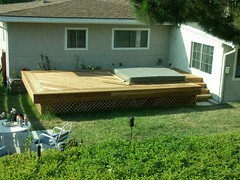 If she had that deck built by a contractor it would have cost her between $6000.00 and $8000.00 U.S. Since you would have to have the redwood imported from the mainland I but it would be at least twice that. Oh my goodness! What a lovely looking deck! In LA, that would’ve cost $7000-8000. You did that for free? by yourself? 96 freaking hours and she’s still an ungrateful B***h?!?!?! I would stop calling her a friend, you know. I’m so sorry that you’ve met a person like that. Oh, just a way to piss me off! Karma will get to her, doncha worry. And take your money… you deserve it.. and more. Wow long time! I know you have been busy with the business but it’s really good to hear from you 🙂 Yeah, I wrote it off to expernace and you are right its gonna come back on her.